Sixty-four catalogues (23 or 25 cm), in the publisher’s wrappers, as issued. - An unbroken run of Bruce McKittrick’s catalogues, 1980-2017. Offered with a selection of 26 catalogues and lists, hors série. ¶ For the most part, unmarked copies in excellent state of preservation. Some catalogues were distributed without an envelope, i.e. closed with adhesive tape (or labels), and an address label, postage meter stamp, etc., is found on one cover. ● Catalogues 59-64 and publications hors série are not shown in our photograph. (23 cm),  pp., illustrations. 26 items; priced. Publisher’s pictorial wrappers. ¶ Annotations in ink and pencil. (23 cm),  pp., folding plate, illustrations. 32 items; priced. Publisher’s printed wrappers. - The folding plate reproduces a 1529 broadside specimen sheet displaying type based on Ludovico degli Arrighi’s italic hand (item 1, $6500). (23 cm), 29 (3) pp., illustrations. 20 items; priced. Publisher’s pictorial wrappers. (23 cm), 24 pp., illustrations. 40 items; priced. Publisher’s printed wrappers. (23 cm), 35 (1) pp., illustrations. 46 items; priced. Printed self-wrappers. ¶ Two marks in margins. (23 cm), 35 (1) pp., illustrations. 46 items; priced. Printed self-wrappers. (23 cm), 51 (1) pp., illustrations. 75 items; priced. Printed self-wrappers. (23 cm), 75 (1) pp., illustrations. 110 items; priced. Printed self-wrappers. (23 cm), 59 (1) pp., illustrations. 86 items; priced. Printed self-wrappers. (23 cm), 96 pp., illustrations. 166 items; priced. Publisher’s pictorial wrappers. - “An excellent range of early continental books on and of pedagogy, all described with the care that comes only from reading the items under examination” (The Book Collector, Autumn 1986, p.377). (23 cm), 48 pp., illustrations. 84 items; priced. Publisher’s pictorial wrappers. - Includes (item 72, $950) a binding decorated with the device of a pelican pecking its breast (on Jacobus de Strada, Epitome, Lyon 1553). (23 cm), 60 (4) pp., illustrations. 112 items; priced. Publisher’s pictorial wrappers. (23 cm), 64 pp., illustrations. 131 + 1 items; priced. Publisher’s pictorial wrappers. (23 cm), 64 pp., illustrations. 133 items; priced. Publisher’s printed wrappers. (23 cm), 64 pp., illustrations. 143 + 2 items; priced. Publisher’s pictorial wrappers. (23 cm), 48 pp., illustrations. 104 + 2 items; priced. Publisher’s printed wrappers. (23 cm), 64 pp., illustrations. 138 + 1 items; priced. Publisher’s pictorial wrappers. (23 cm), 48 pp., illustrations. 104 items; priced. Publisher’s pictorial wrappers. (23 cm), 40 pp., illustrations. 80 items; priced. Publisher’s pictorial wrappers. (23 cm), 72 pp., illustrations. 200 items; priced. Publisher’s pictorial wrappers. - Error in imposition: items 14-18, 23-28 are not printed. ¶ Ink annotations in in two margins (items 130, 191). (23 cm), 72 pp., illustrations. 200 items; priced. Publisher’s printed wrappers. (23 cm), 48 pp., illustrations. 97 items; priced. Publisher’s pictorial wrappers. (23 cm), 56 pp., 2 colour plates (pls.I-IV, inserted after pp.16, 40), illustrations. 126 items; priced. Publisher’s printed wrappers. (23 cm), 48 pp., illustrations. 100 items; priced. Publisher’s pictorial wrappers. (23 cm), 46 pp., illustrations. 105 items; priced. Publisher’s pictorial wrappers. (23 cm), 54 pp., illustrations. 108 items; priced. Publisher’s pictorial wrappers. (23 cm), 34 pp., illustrations. 80 items; priced. Publisher’s pictorial wrappers. (23 cm), 34 pp., illustrations. 100 items; priced. Publisher’s pictorial wrappers. (23 cm), 48 pp., illustrations (some in colour). 60 items; priced. Publisher’s printed wrappers. (23 cm), 34 pp., illustrations (including 2 in colour on wrappers). 65 items; priced. Publisher’s pictorial wrappers. Narberth, PA, Bruce McKittrick Rare Books Inc., [1998? (23 cm), 38 pp., illustrations (including 4 in colour on folding wrapper).70 + 20 items; priced. Publisher’s pictorial wrappers. Narberth, PA, Bruce McKittrick Rare Books Inc., [1999? (23 cm), 48 pp., illustrations (including 3 in colour on wrappers). 77 items; priced. Publisher’s pictorial wrappers. (23 cm), 36 pp., illustrations (including 3 in colour on wrappers). 55 items; priced. Publisher’s pictorial wrappers. (23 cm), 36 pp., illustrations (including 2 in colour on wrappers). 92 items; priced. Publisher’s pictorial wrappers. (23 cm), 36 pp., illustrations (including 3 in colour on wrappers). 65 items; priced. Publisher’s pictorial wrappers. (23 cm), 36 pp., colour plate (inserted after p.16), illustrations (including 4 in colour on folding wrapper). 62 items; priced. Publisher’s pictorial wrappers. (23 cm), 40 pp., illustrations (including 3 in colour on wrappers). 70 items; priced. Publisher’s pictorial wrappers. (23 cm), 46 pp., illustrations (including 3 in colour on wrappers). 100 items; priced. Publisher’s pictorial wrappers. (23 cm), 46 pp., illustrations (including 3 in colour on wrappers). 85 items; priced. Publisher’s pictorial wrappers. (25 cm), 44 pp., 2 folding plate (pls.I-II, inserted after pp.6, 42), illustrations (in colour). 40 items; priced. Publisher’s pictorial wrappers. - Includes a volume with decorated fore-edge from the library of the Marquis of Astorga, here interpreted as insignia of Cosimo I de’Medici and his wife Eleanora of Toledo (on Ricardus de Mediavilla, Venice 1509). Noticed in The Book Collector, Spring 2001, p.102. (25 cm), 48 pp., illustrations (some in colour). 60 items; priced. Publisher’s pictorial wrappers. (25 cm), 36 pp., illustrations (some in colour). 80 items; priced. Publisher’s pictorial wrappers. (25 cm), 32 pp., illustrations (some in colour). 60 items; priced. Publisher’s pictorial wrappers. (25 cm), 48 pp., illustrations (some in colour). 100 items; priced. Publisher’s pictorial wrappers. - “Some unusual bookbindings, the most so a sixteenth-century Lyon Pliny with the sides of the alum-tawed hide covered in paper, painted and tooled in gilt” (from a notice in The Book Collector, Spring 2004, p.89). (25 cm), 48 pp., illustrations (some colour). 64 items. Publisher’s pictorial wrappers. 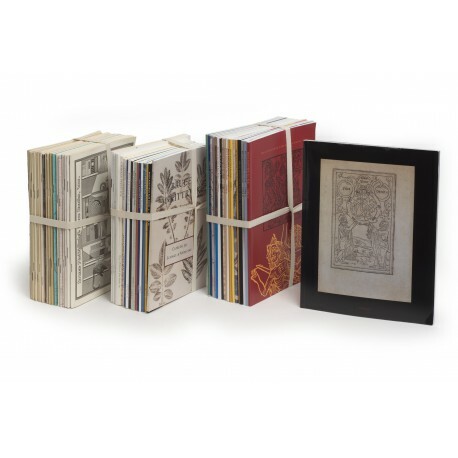 - Includes (item 63, $25,000) a bound album of Vredeman de Vries engravings from the library of the architects Philips (1607-1678) and Jan Vingboons (1617-1670). Noticed in The Book Collector, Summer 2004, pp.273-274. (25 cm), 46 pp., illustrations (some in colour). 80 items; priced. Publisher’s pictorial wrappers. (25 cm), 36 pp., illustrations (some in colour). 79 items; priced. Publisher’s pictorial wrappers. [Stock catalogues, numbered series: 48] Catalog 48 [cover title:] "From the primitive hut to the superb mansion"
(25 cm), 36 pp., illustrations (some in colour). 75 items; priced. Publisher’s pictorial wrappers. (25 cm), 36 pp., illustrations (some in colour). 60 items; priced. Publisher’s pictorial wrappers. (25 cm), 36 pp., illustrations (some in colour). 50 items; priced. Publisher’s pictorial wrappers. - The undated catalogue is noticed in The Book Collector, Summer 2006, p.255. (25 cm), 35 (1) pp., illustrations (some in colour). 59 items; priced. Publisher’s pictorial wrappers. (25 cm), 44 pp., illustrations (some in colour). 82 items; priced. Publisher’s pictorial wrappers. (25 cm), 40 pp., illustrations (some in colour). 74 items; priced. Publisher’s pictorial wrappers. (25 × 20 cm),  pp., illustrations (in colour). items; priced. Publisher’s pictorial wrappers. - Includes a binding ornamented with the Gryphius printers’ device (on Diodorus Siculus, Bibliothecae historiae libri XVII, Lyon: Sébastien Gryphe, 1552). (25 cm), (2) 36 (2) pp., illustrations (some in colour). 56 items; priced. Publisher’s printed wrappers. - Includes a binding (item 51) decorated with the device of Jérôme de Marnef (Suetonius, XII Caesares, Paris 1560). (25 cm), 52 pp., illustrations (some in colour). 97 items; priced. Publisher’s pictorial wrappers. (25 cm), 40 pp., illustrations (some in colour). 52 items; priced. Publisher’s pictorial wrappers. (25 cm), 36 pp., folding plate loosely inserted (for item 43), illustrations (some in colour). 55 items; priced. Publisher’s pictorial wrappers. (25 cm), 48 pp., folding sheet (2 black & white illustrations), text illustrations (some in colour). 59 items; priced. Publisher’s pictorial wrappers. (25 cm), 40 pp., illustrations (some in colour). 61 items; priced. Publisher’s pictorial wrappers. (25 cm), 44 pp., illustrations (most in colour). 70 items; priced. Publisher’s pictorial wrappers. (25 cm), 52 pp., illustrations (most in colour). 75 items; priced. Publisher's pictorial wrappers. (25 cm), 62 (2) pp., illustrations (most in colour). 80 items; priced. Publisher's pictorial wrappers. Folded sheet (58 × 45 cm), illustrations. 15 items; priced. Folded sheet (58 × 45 cm), illustrations. 16 items; priced. Folded sheet (22 × 58 cm), 2 illustrations. items; priced. - The undated catalogue is noticed in The Book Collector, Winter 2006, p.577. Folded sheet (22 × 88 cm), 1 illustration. items; priced. Folded sheet (21 × 58 cm), 2 illustrations. items; priced. - The undated catalogue is noticed in The Book Collector, Winter 2006, p.577. Folded sheet (21 × 58 cm), 1 illustration. items; priced. - The undated catalogue is noticed in The Book Collector, Winter 2006, p.577. Folded sheet (21 × 58 cm), illustrations. items; priced. Folded sheet (21 × 58 cm), 2 illustrations. items; priced. Folded sheet (21 × 58 cm), 1 illustrations. items; priced. Folded sheet (21 × 44 cm),  items; priced. Folded sheet (21 × 44 cm), 1 illustration. items; priced. Folded sheet (23 × 44 cm), 1 illustration. items; priced. (13.5 × 13 cm), 28 pp., illustrations. 42 items; priced. Publisher’s pictorial wrappers. - Noticed in The Book Collector, Spring 2003, p.69. (21.5 cm), 32 pp., illustrations. 70 items. Publisher’s pictorial wrappers. Folded sheet 59 × 42 cm), illustrations. 30 items; priced. (14 × 20.5 cm), 36 pp., illustrations. 58 items; priced. Publisher’s pictorial wrappers. (14 × 21.5 cm), (2) 17 (1) pp., illustrations. 40 items; priced. Pictorial self-wrappers. (26.5 × 21.5 cm),  pp., colour illustrations. items; priced. Pictorial self-wrappers. (16.5 × 22 cm),  pp., colour illustrations. items; priced. 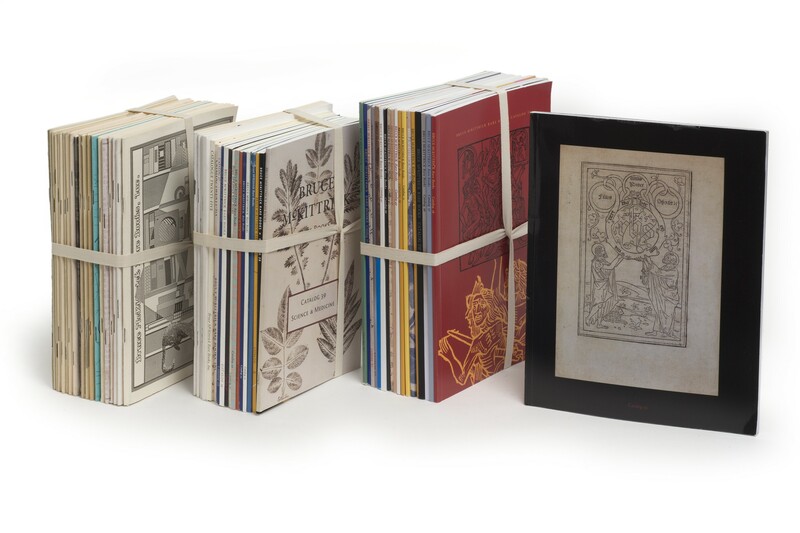 Pictorial self-wrappers, spiral wire binding. Three lists (various formats), as issued.